Virgin Trains has named one of its trains after one of Scotland’s most famous cultural icons in celebration of its role in serving Glasgow. The Charles Rennie Mackintosh Express will depart Scotland’s biggest city today in support of Mackintosh 150, a year-long programme of events throughout 2018 celebrating the 150th anniversary of the birth of Glasgow’s renowned artist, architect and designer. 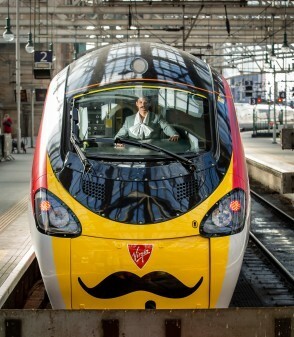 The 390008 Pendolino train, adorned with Mackintosh’s trademark moustache on the front and his name displayed in his own lettering on plaques on either side, arrived into Glasgow Central Station at 09.45am this morning. Its nameplate was unveiled by Michael Stewart, Virgin Trains’ General Manager for Scotland on the west coast route, and Councillor David McDonald, Chair of Glasgow Life and Deputy Leader of Glasgow City Council.Virgin Trains’ customers across the west coast route are being encouraged to take photos of themselves while standing on the platform next to the moustache or nameplate. They can find out where the Mack Express will be on any particular day by tweeting the @VirginTrains team with the #trackthemack hashtag. Passengers who take the best selfies with the train will be eligible to win two First Class return tickets for travel from London, Birmingham or Preston to Glasgow between April 16 and June 30 and free entry to a major new Mackintosh exhibition taking place in the city. It is the first time in nearly 15 years that Virgin Trains has named a train in Scotland on its west coast route. Two other trains have previously been named after Charles Rennie Mackintosh, the first in 1982 and the second in 1996, shortly before Virgin Trains took over services between Glasgow and London. The last train named after the Glasgow artist was withdrawn from service when Virgin introduced its fleet of tilting Pendolino and Super Voyager trains, allowing regular journey times between Glasgow and London to be cut from more than five hours to 4hr32min. Mackintosh 150 is being co-ordinated by Mackintosh heritage partners from across Glasgow and beyond. As well as commemorating his remarkable achievements and creative genius as an architect, artist and designer, Mackintosh 150 provides a focal point in safeguarding Mackintosh legacy for future generations, inspiring more young people to take an interest in art and design and promoting his unique portfolio for visitors and tourists. Indeed, the significance of Charles Rennie Mackintosh has been identified as one of the key drivers of the Glasgow Tourism and Visitor Plan to 2023, which aims to grow the city’s economy by increasing overnight leisure tourism visits by one million over the next six years. Born in Glasgow on June 7th 1868, Mackintosh is considered one of the principal exponents of the Glasgow Style. He went on to be regarded as one of the most creative figures of the 20th century and a leading figure in both the Scottish Arts and Crafts Movement and European Art Nouveau. Councillor David McDonald, the Chair of Glasgow Life and Deputy Leader of Glasgow City Council, said: “The legacy of Charles Rennie Mackintosh is part of the very fabric of Glasgow and his buildings, art and design are of international importance; attracting tourists from across the world to our city.